Lawyers regulator proves no deterrent to poor legal services. 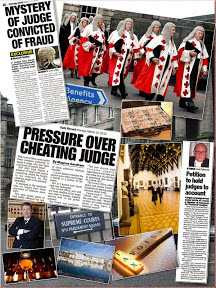 SCOTLAND’S ‘independent’ regulator of legal services has admitted complaints against rogue solicitors & law firms have again risen in the past “challenging year” according to the latest Annual Report 2016-17 of the Scottish Legal Complaints Commission (SLCC). 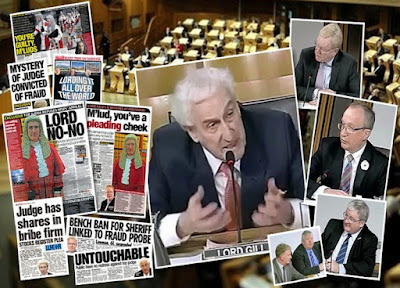 The SLCC’s past year was marked by the Anderson Strathern appeal, in which Court of Session judge Lord Malcolm – real name Colin Campbell QC - ruled unlawful the SLCC's previous practice of classifying certain single issue complaints as hybrid (raising issues of both service and conduct). 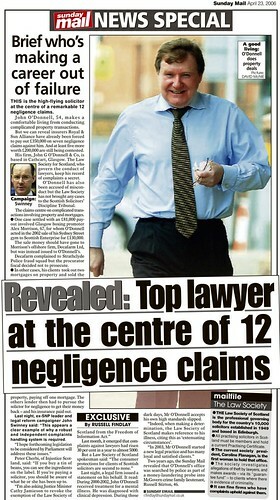 However, an investigation of the ruling by Lord Malcolm – who is also a Privy Councillor – revealed a top QC who was identified in complaints relating to the acceptance of £5,000 a time cash payments and accusations of misrepresenting clients in a case directly involving Lord Malcolm - escaped investigation as a result of the same Court of Session ruling on 31 August 2016. Earlier this year, the SLCC was branded a “toothless waste of time” by Alex Neil MSP (SNP Airdrie and Shotts) – who called for major reform of the Scottish Legal Complaints Commission after a Sunday Mail investigation revealed the SLCC refused to investigate serious complaints & cash payments involving ‘top’ planning law QC John Campbell (67) of Hastie Stable & Trinity Chambers. 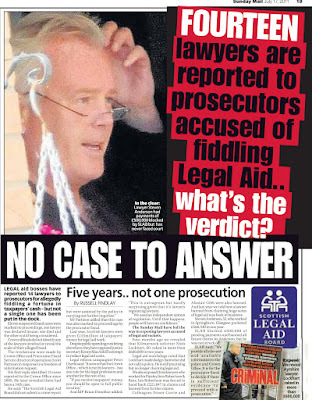 A full report on the John Campbell case impacted on by Lord Malcolm’s ruling can be found here: CASH ADVANCE: QC says ‘Can I have £5k cash on the way to the Law Society?’ - MSP calls for reform of ‘toothless’ Scottish Legal Complaints Commission as regulator turns blind eye on Advocates cash payments scandal. 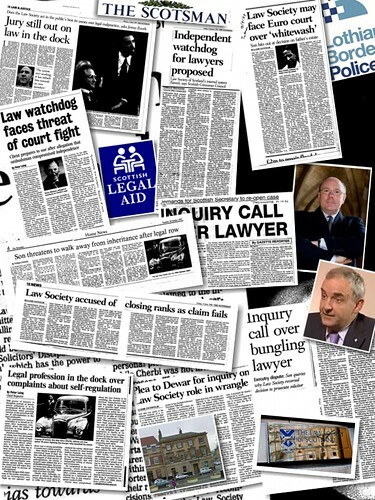 Further litigation occurred with the Law Society of Scotland over the SLCC's power to then reclassify cases, in which the court eventually found for the Legal Complaints Commission but resulted in a large number of complaints being suspended, with no progress made until the ruling in June. Over the year, complaints received rose from 1,132 to 1,155, up 2% on top of the previous year’s 12% rise. 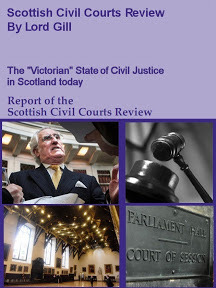 However, an analysis of the complaints statistics, and contact with persons raising complaints with the pro-lawyer Scottish Legal Complaints Commission reveal the SLCC is more often than not – too eager to knock back complaints against solicitors – in a similar manner once practiced by the Law Society of Scotland. In the past year, a total of 414 cases were accepted for conduct or service investigation, or a combination of the two (previous year 408), and 171 (compared with 226) were deemed ineligible as time barred or being "frivolous, vexatious or totally without merit". A further 251 cases (previous year 188) were resolved, withdrawn or discontinued without a formal investigation. Solicitors accounted for 410 of the complaints accepted while 4 of the cases related to members of the Faculty of Advocates. However, this year, the success rate of mediation was much lower – indicating perhaps complainants have become wise to a process dubbed as “rigged” by some, after it was discovered some ‘independent’ mediators have connections to some of the law firms facing complaints investigations. In the past year, mediated resolutions were achieved in only 27 complaints (44 the previous year), a lower success rate than previously at 58%. Sixty three cases were resolved during or at the conclusion of the investigation stage (down from 128), and the number receiving a final determination by a committee of commissioners fell from 102 to 95, of which 44 (down from 58) were upheld in whole or part. The number of investigations in hand at the year end rose from 664 to 807, having jumped from 473 at the start of the previous year. Residential conveyancing was again the most frequent area of complaint, at 22% of those received, closely followed by litigation (21%), then executries, wills and trusts (14%), family law (10%) and crime (7%). Commercial property and leasing accounted for 4%, as did "personal conduct". Other categories of work, each comprising fewer than 3% of complaints, accounted for the remaining 18%. Regarding the nature of the complaint, however, failure to communicate effectively was a clear leader at 26% (but down from 43%), followed by failure to advise adequately (20%, up from 14%), failure to provide information (14%, down from 15%), failure to prepare adequately (11%, up from 6%), failure to follow instructions (10%, up from 6%), and delay (unchanged at 8%). Other categories made up 6% of cases. The accounts for the year, also published today, disclose a net operating loss up from £114,000 to £194,000, though income rose from £2.714m to £2.763m. Net assets fell from £675,000 to £421,000. SLCC Chief Executive Neil Stevenson added “this has been a challenging year, with significant litigation that has driven delays and costs and which was outwith our control. We are delighted the court upheld our position, and hope we can now move beyond some of these challenges to work with others in the sector to improve confidence in regulation. The SLCC’s Annual Report and Annual Accounts are laid before the Scottish Parliament by the Minister for Community Safety and Legal Affairs. 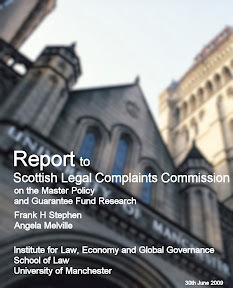 In the past NINE years since the Scottish Legal Complaints Commission was created in 2008, the Law Society backed ‘independent’ regulator of complaints against legal practitioners in Scotland – including solicitors and advocates – has more often than not seen year on year rises in complaints while becoming involved in protracted orchestrated arguments with lawyers over funding for the legal quango. 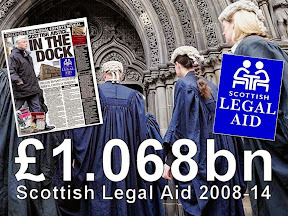 In reality, funding for the SLCC – running at around £3million a year - is secured from a client sourced complaints levy – where hikes in solicitors legal fees to clients & consumers are used to pay for the upkeep and operation of the Scottish Legal Complaints Commission. 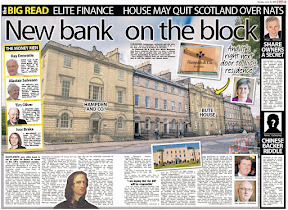 Since 2008, the SLCC has received nearly £30 million of client sourced funds - yet it is now clear the pro-lawyer quango has had little impact on the generally poor standards of expensive legal services available in Scotland. Currently the Scottish Legal Complaints Commission is involved in lobbying against a Scottish Parliament investigation into self regulation of the legal profession, a full report on this can be found here: LOOKING OUT FOR LAWYERS: Scottish Ministers unite with lawyer dominated review panel & pro-lawyer legal regulator – to urge Holyrood MSPs delay probe on proposals for independent regulation of legal services. The SLCC, along with the Law Society of Scotland and other legal interests have made submissions to the Scottish Parliament’s Public Petitions Committee calling for MSPs to hold off on hearing petitions calling for independent regulation – until a Scottish Government review on regulation of legal services reports back at the end of 2018. 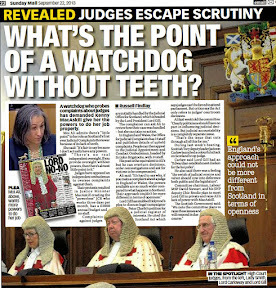 The ‘independent’ review, is in actuality being run by lawyers. The Court of Session recently ruled in favour of the SLCC in refusing an application by a firm of solicitors for leave to appeal one of the Commission’s decisions. The application came from a firm seeking leave to appeal a decision that a number of issues of complaint were accepted as eligible services complaints and were not frivolous, vexatious or totally without merit. It was unusual in that only some issues of complaint accepted were being appealed. 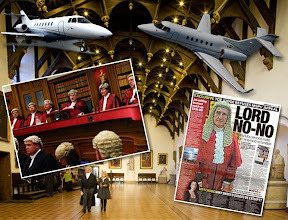 The full findings – by Lord Glennie are available here: NOTE OF REASONS delivered by LORD GLENNIE in the application for leave to appeal by X LLP AND OTHERS (Appellant) against SCOTTISH LEGAL COMPLAINTS COMMISSION (Respondent). However, it should be noted the Court ruling does not identify the law firm involved. Lord Glennie went on to reiterate that “the nature and extent of the investigation to be carried out by the Commission, and how they go about it, is pre-eminently a matter for the Commission itself.” Having considered that there was no basis for establishing that the SLCC had erred in law or acted irrationally the Court refused leave to appeal the decision. What was also highlighted in this case was the time and resource expended by the SLCC in carrying out this sifting function. 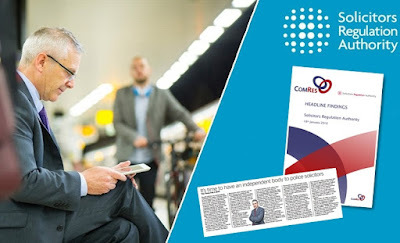 The Court also made reference to the detail in which the SLCC had dealt with this determination, stating “The Commission’s decision in the present case is very fully reasoned… The decision deals with each complaint individually and over a number of paragraphs”. The resources expended by the SLCC in relation to appeals bears a significant financial cost to the organisation. In this particular case, costs will be recovered following the decision of the Court to award expenses. However such an award is unlikely to recompense the full cost of all work done in relation to the appeal, and the process of contesting appeals continues to be a significant factor which the SLCC has to contend with in managing its budget. 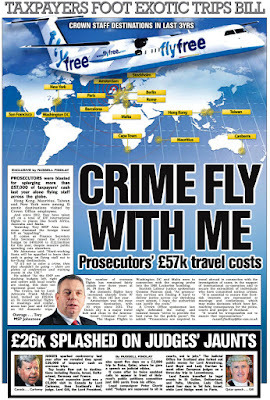 The SLCC itself was created at a cost of over £2 million pounds of public cash in 2008 – by a Scottish Government team led by Angela McArthur - who was since appointed as Chief Executive of the Parole Board of Scotland from 2009 to present day. 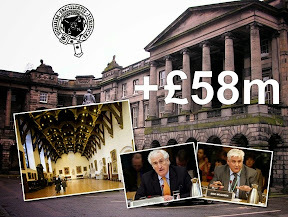 Edinburgh Council paid lawyers over £15m in 3 years. THE CITY of Edinburgh Council has been forced to reveal a list of law firms and advocates involved in a staggering Council public cash spend of £15 million on lawyers - in only three years. 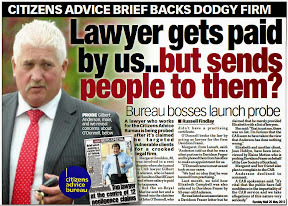 However, the Council only revealed the list - after initially refusing a request to disclose the identities of lawyers receiving millions in public cash for work which in some cases insiders allege is being used to keep law firms afloat in ‘difficult times’. Among the list now disclosed via Freedom of Information legislation are law firms used by Edinburgh Council - who allegedly harassed & intimidated city residents for recovery of fees for dodgy construction work carried out on orders of the Council while staff from the Property Conservation Department took bribes from contractors & construction firms. 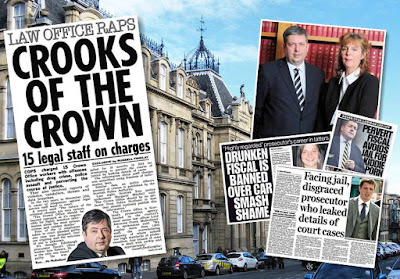 Edinburgh City Council was flooded with nearly 1,000 complaints about statutory repairs worth £30bn – yet despite a report saying lessons had been learned, law firms have continued to target residents over dodgy work orders. 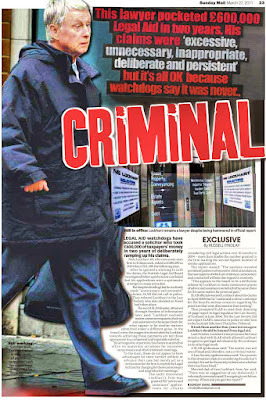 The scandal prompted a Police Scotland fraud probe amid claims of bribery and billing for work not done. It was also discovered gifts & hospitality for staff in departments of the council was widespread. However, Edinburgh Council has bitterly fought any moves to release exact figures for payments to individual law firms, and is now fighting a further Freedom of Information probe on legal fees and other expenses paid to a former Lord Advocate – Elish Angiolini – who was accused of undermining the judiciary by former Lord President Lord Hamilton. The figures for Edinburgh Council’s spend on lawyers from 2014 to 2017, obtained via Freedom of Information legislation – reveal the Councils’ staggering £5 million a year spend on in-house, external lawyers and Advocates. From January 2014 to 31 May 2017, the figure revealed by Edinburgh Council details some £15,265,175 spent on lawyers. The totals for each year since reveal: 2014-2015: £4,812,170, from 2015-2016: £4,104,736, from 2016-2017: £4,649,121 and in only two months from 1.4.17 to 31.5.17 a further £682,896. 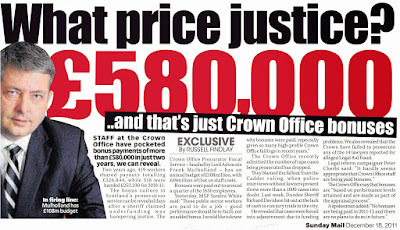 In the same period Edinburgh Council also paid the sum of £229,107 to the Scottish Courts and Tribunals Service (SCTS). Initially, Edinburgh Council attempted to argue that the commercial interests of the Council, the solicitors, advocates and QC listed in the disclosure would be harmed by the disclosure of the withheld information. However the identities of law firms involved in the payments, but not the exact payments to the actual law firms themselves were eventually disclosed. Rt Hon Dame Elish Angiolini DBE QC, Ruth Innes, David Jack, Morag Jack. The Scottish Information Commissioner has now been approached to investigate the case and seek disclosure of the amounts of secret legal fees paid to former Lord Advocate Elish Angiolini – after Edinburgh Council claimed the payments of substantial sums of public cash amounted to ‘personal data’. A separate approach to the SIC is to be made over exact payments to law firms, given the sheer size of payments of public cash – which some legal insiders contend are an indication of law firms generating work for themselves to keep them afloat. 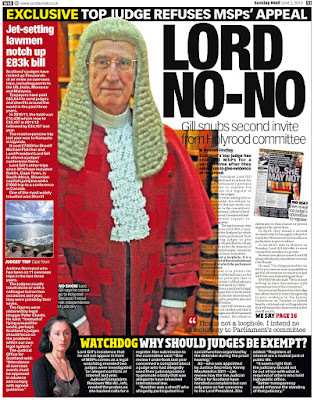 Ministers, lawyers & legal regulator seek Holyrood probe delay. A PROPOSAL before the Scottish Parliament calling for views on scrapping self regulation of the legal profession in Scotland - has received representations from Scottish Ministers , the Chair of a pro-lawyer review panel and a Law Society-backed legal regulator – calling for MSPs to back off from investigating regulation of legal services. Meanwhile, representations from the Scottish Government, and an unsigned letter from the Chair of a lawyer dominated review panel - are careful not to demand outright, but infer MSPs halt their consideration of calls to scrap the historically biased system of self regulation of lawyers in Scotland. The latest submissions from the three pro-lawyer groups come in the wake of a call for evidence by the Scottish Parliament’s Petitions Committee on two public petitions seeking to replace self regulation of the legal profession in Scotland with fully independent regulation of legal services – as occurs in England & Wales. Earlier this year, former Cabinet Minister Alex Neil MSP (SNP Airdrie and Shotts) said the ‘independent’ review created by the Scottish Government, should include judges - and the membership of the review team should be expanded to balance up the panel’s current top heavy legal interests membership. 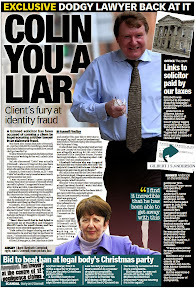 In another development, Alex Neil recently branded the Scottish Legal Complaints Commission (SLCC) “a toothless waste of time” – after the legal services regulator failed to act in a high profile case involving a senior QC – John Campbell – who is caught up in a cash payments scandal - which has since led to information provided to journalists on other Advocates & QCs who have demanded & pocketed substantial and apparently undeclared cash sums from clients. During the debate on the two petitions – on 21 September - members of the Public Petitions Committee agreed to write to the Scottish Government, the Scottish Legal Complaints Commission, the Law Society of Scotland, the Faculty of Advocates, Scottish Solicitors' Discipline Tribunal, Citizens Advice Scotland and the Judicial Complaints Reviewer. It is also open for anyone else to put their views to the Petitions Committee on these petitions, or for constituents to request their MSPs submit material on their constituents behalf. The Convener: The next two new petitions are PE1660 by Bill Tait and PE1661 by Melanie Collins, both of which raise similar issues in relation to the current system for complaints about legal services in Scotland. Members have a copy of the petitions and the respective SPICe briefings. PE1660 calls on the Scottish Parliament to urge the Scottish Government to review the operation of the Scottish Legal Complaints Commission to make the process of legal complaints more transparent and independent. PE1661 calls on the Scottish Parliament to urge the Scottish Government to reform and amend the regulation of complaints about the legal profession in Scotland, which is currently delegated to the Scottish Legal Complaints Commission, by creating a new independent regulator of legal services with powers equivalent to the Solicitors Regulation Authority, the Legal Ombudsman, the Bar Standards Board and the Solicitors Disciplinary Tribunal, all of which serve consumers and clients of legal service providers in England and Wales. Do members have any comments or suggestions for action on the petition? Michelle Ballantyne: First of all, I note that there is a review under way. However, although it was launched in April, it is not due to report until the end of next year, which seems an awfully long time. I am concerned about a turkeys voting for Christmas arrangement with regard to oversight of this matter. There needs to be some clear water between lawyers and those who review them, and this feels a bit close for comfort. We should check where the review is going and what it is looking at, because if it has been launched, the question is whether we need to be doing something parallel alongside it. Angus MacDonald: Both petitions are extremely timely. Bill Tait and Melanie Collins have highlighted serious issues with regard to the legal profession and the way in which the SLCC operates in respect of complaints. I agree with Melanie Collins that there is a strong argument in favour of creating a new independent regulator of legal services, and I agree with Bill Tait’s call to make the process of legal complaints more transparent and independent. 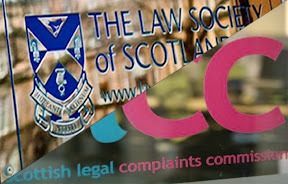 In recent years, we have seen a degree of conflict between the SLCC and the Law Society of Scotland over the operation of the complaints system. I am sure that I was not the only MSP to receive representations from the Law Society earlier this year, stating frustration and disappointment at the increase in the SLCC levy to be paid by solicitors. It also stated that the complaints system was slow, complex, cumbersome and expensive. There is no doubt in my mind that this is the right time to look at this issue. As Michelle Ballantyne has mentioned, the Scottish Government has acknowledged that the current process for people wishing to make complaints about their solicitor is too slow and complex, so I was certainly pleased to see the Scottish Government launch its independent review of the regulation. However, I take on board Michelle Ballantyne’s point about the review not being due to report back until the end of 2018; the period seems quite lengthy, but clearly, we can contact the Government for clarification. Given the similarity of the two petitions, there is a strong argument for joining them together to help move them forward. The Convener: First of all, does the committee agree to join the petitions together? It seems to me that they deal with the same issues. Brian Whittle: Am I correct in thinking that the Law Society called for a change and was rebuffed? Angus MacDonald: I am not entirely sure—it certainly was not happy. Rona Mackay: It was about the levy. It was not happy with some of the SLCC’s operation, but, as far as I am aware, it has not formally called for a change. Brian Whittle: I thought that it was investigating this very point and was rebuffed. I might be wrong. The Convener: It would be worth getting it clear in our own heads where all of this stands. We can obviously ask for that information. The suggestion is that we write to the Scottish Government about the review’s timescale and remit, and I think that we should write to the relevant stakeholder bodies to ask about what issues they have. It does not feel that long since the legislation was passed, so it would be a natural time to look at and reflect on whether it has been effective and what the alternatives might be. My sense is that, when the legislation went through Parliament, we wrestled with the options—it did not go through without debate. Perhaps we should look at whether this is a bedding-in issue or an actual structural problem and whether, as the petitioner suggests, the issue needs to be revisited and a different kind of regulatory body put in place. I think that we have agreed to write to the Scottish Government, the Scottish Legal Complaints Commission, the Law Society of Scotland and the Faculty of Advocates. 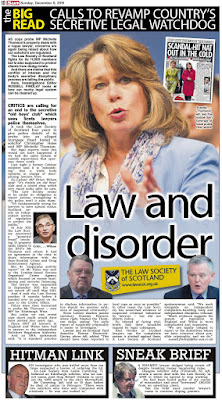 Citizens Advice Scotland was mentioned, as was the Scottish Solicitors Discipline Tribunal. Are there any others? Angus MacDonald: Would it be worth contacting the Judicial Complaints Reviewer? Although it deals with judicial complaints, as per the title, it would be good to get its view, if it has one. Of course, it is not compelled to reply. The Convener: Do we agree to deal with both petitions in that way? I refer to your letter dated 28 September 2017 seeking the Scottish Government’s views on petition PE1660 by Bill Tait with regards to the operation of the Scottish Legal Complaints Commission, and petition PE1661 by Melanie Collins regarding amending the regulation of the complaints about the legal profession. The independent review of the regulation of legal services, announced in April 2017, has been set up to look into these matters and that we understand that the chair, Esther Roberton, will be responding to the committee separately. The chair is due to report to Ministers by the end of July 2018 and will include the review findings around the complaints handling system. I refer to your letter dated 28 September 2017 seeking the Scottish Government's views on the calls from Bill Tait to review the operation of the Scottish Legal Complaints Commission, and from Melanie Collins to reform and amend the regulation of complaints about the legal profession in Scotland. The independent review of the regulation of legal services was announced by the Minister of Community Safety and Legal Affairs, Annabelle Ewing on 25 April 2017. I chair the review and my deadline to report to Ministers is by the end of July 2018. As described in the remit for the review, which is broad, its purpose is to make independent recommendations to reform and modernise the statutory framework for the regulation of legal services and complaints handling. We are committed to ensuring that our recommendations focus on consumers, providers of legal services and the market place for legal services in Scotland. The time is right to appraise the regulatory system, which last saw substantial changes as a consequence of the 2010 Act, and which the current regulators and others agree is ready for review. The panel, made up of individuals with experience in legal services, consumer interests, regulatory systems, and complaints systems have met five times to date. Gathering evidence from a full range of stakeholders with an interest in our work is crucial to help inform our findings. This includes professional bodies, regulators, consumer bodies, a wide range of providers of legal services, business organisations and others. Stakeholder events will take place in November-December, with a formal call for evidence launching at the turn of the year. The review is also considering relevant information such as regulation in other sectors and in legal services regulatory systems from other parts of the world, and has commissioned a specific study into unregulated legal services. I have copied this letter to the Justice Committee and am happy to provide further updates if either committee wishes those in due course. Thank you for your letter of 26 September about the Petitions Committee on 21 September about petitions PE1660 (Bill Tait) and PE1661 (Melanie Collins) relating to regulation and complaints in legal services. We spoke on 27 October. For some reason, which neither of us could identify, we had not received the original letter, although had been expecting it and indeed had emailed on 10 October to ask if we were to receive such a letter. We’re very grateful, therefore, that you allowed us a short extension to respond. We agree there is a strong case for reform in some areas, we have actively lobbied for this, and we’re confident the current Independent review of the regulation of legal services will address matters. In this letter the SLCC sets out our general position on reform first, which significantly pre-dates the petitions, and then addresses some specific issues raised in the petitions. 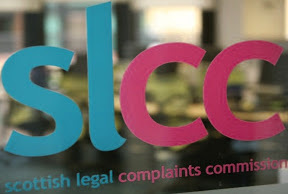 The Scottish Legal Complaints Commission (SLCC) is the independent gateway for all complaints about solicitors, advocates and commercial attorneys. We have experience of handling over 10,000 complaints, and last year alone awarded consumer redress over £324,000. An independent Consumer Panel also helps guide our work. The SLCC has actively called for radical change to the regulation of the sector. In July 2016 we published our paper #ReimagineRegulation, which is available on our website: https://www.scottishlegalcomplaints.org.uk/reimagine-regulation.aspx. A detailed set of supporting appendices provide, among other things, a history of the Scottish Parliament’s involvement in these issues since the parliament’s creation. We hope this is of assistance to the Committee. Up to four statutory bodies can be involved in a single case, causing duplication and delay. We provide a visual representation of the ‘customer journey’ to highlight the current problems. Complex and inflexible processes have lost sight of the principles of better regulation and distracted from a focus on the outcomes for the public and sector. In too many cases redress is awarded but failings in the current system mean the complainer does not receive it, undermining confidence in the system. For example, conveyancing is a major driver of all regulatory costs across more than one statutory body - how do we either better support, or more proportionately regulate, in that area to reduce this consumer detriment? Professional voices in debates in regulation are always informed, strong, and well resourced. We need to understand consumer’s need, and hear their voice, if regulation is to be credible. Modern regulation is about identifying and targeting risk, and creating proportionate and agile structures to tackle issues in fast moving markets. 10 years after our establishment we too often find it is the same basic issues causing problems with consumers, with little done (it being outwith the SLCC’s remit) to tackle the root cause. A key question is raised about a single regulator, or at least complaints body, and the SLCC believe this merits serious consideration. The cost and confusion caused by four different bodies, for a sector of only 11,000 professionals, is an issue in its own right. Even if a single body is not eventually possible, debating that model will more sharply focus the discussion on the core purpose and aims of regulation in the sector, and the key mechanism to reduce risk and support a sustainable market, rather than starting discussion from the perspective of the current fragmented roles and responsibilities. The SLCC also agrees oversight issues need considered. At the moment there is a fractured framework. For example, whilst the SLCC is overseen by an independent Board of Commissioners appointed by government, is subject to Freedom of Information, and comes within the remit of Audit Scotland, not every organisation involved in regulation is currently so transparent, nor under such financial scrutiny. At the moment no bodies, including the SLCC, come under the best practice promoted by the Regulatory Reform (Scotland) Act 2014. As we continue the journey of the modernisation of legal regulation a single approach to oversight, with consistent minimum legislative requirements, would be a positive outcome. Several statutory levies are payable by lawyers, and the value of the fees, and the balance of spending between regulatory and representative functions, should be considered in the round. None of the bodies currently involved have their budgets approved by parliament. In all governance matters legislation is balancing the need for regulation independent from government with what are appropriate governance structures. As with many issues raised, this may be best looked at in the round, as from the lawyer and consumer perspective it is the total cost of regulation which is key. The SLCC had already raised concern at the only route of appeal being to the Court of Session. This point was made in our paper last year about reform, and we believe the legislation should be amended to allow a more proportionate mechanism. This is part of reducing the current complaints maze, so there is a single investigation, and single set of decisions, and a single appeal. https://www.gov.uk/government/consultations/promoting-professionalism-reforming- regulation para 4.18 onwards). These petitions highlight that this is likely to be the expectation of the public. In all of this public and consumer voices are vital. There is a deeply worrying lack of independent research into consumer needs and detriments in Scotland in the legal sector. The SLCC’s Consumer Panel has been instrumental in flagging this in recent years. However, the government’s own previous review of legal regulation in 2006 had raised this as a concern, and the situation has, if anything, deteriorated further since then (for example with Consumer Focus Scotland no longer in existence and doing work in this field). A top priority should be the creation of a better evidence base from those who use services, alongside the professional voices. Ignoring those consumer voices has consequences, and this is relevant to one specific issue raised in this petition. In debating the legislation that led to the creation of the SLCC consumer groups valued transparency, and that the SLCC should be able to publish decisions about complaints. However, after extensive lobbying by other interests a decision was made that not only would the outcome of complaints not be published, but that a new criminal offence would be created for any divulgence of information, an offence so wide that it covers even confirming if a complaint has been received. This is out of step with other professions and sectors, and other jurisdictions, where there is more discretion to publish when there is public interest. The SLCC understands the frustration of complainers, but must abide by the current legislative framework. As with most issues covered in the petition, we had raised this ourselves last year in our paper on reform. We noted in the discussion within the committee mention of our consultation on the levy for solicitors last year (the fees all solicitors, advocates and commercial attorneys need to pay each year, set to cover the cost of processing complaints). Although in past years the SLCC had managed to reduce the levy, a significant increase was proposed last year. This was driven by a number of factors, the two biggest of which were a rise in complaints and a judicial review, and 17 appeals to the Court of Session, launched by the Law Society of Scotland. The rise in complaints had been steep, with a 12% increase in complaints against solicitors within 12 months. This has now been followed in the subsequent year by a further 2% rise, and current predictions are that complaint numbers are continuing to increase. We recognise paying the cost of complaints is not popular with any sector, and as a member led organisation the Law Society would always challenge costs, but a more positive debate would have focussed on how to tackle the common cause of complaints and reduce harm to the public. In terms of the number of litigations by the professional body, we were pleased to win the ‘test case’, and to have the court confirm SLCC had been acting in a way consistent with ‘good public administration’. We had publicly warned these litigations would cause cost, delay and worry to complainers and practitioners, and were unnecessary, as proved to be the case. We were disappointed that in their lobbying against the levy the Law Society did not mention its own actions were one of the big drivers of cost. I hope our #ReimagineRegulation paper displays a body which is not only ‘up for’ change, but actively trying to stimulate a debate about how parliament, government, consumers and the profession can work together to create a better system in Scotland. The SLCC is certainly confident that the independent review of legal regulation will actively consider the issues we have been raising over the last 18 months, and which the petitions support from a public perspective, and look forward to the final report on these complex issues currently expected in July 2018. 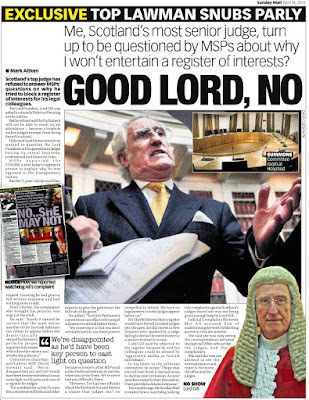 Lord Carloway failed to make any convicting argument against judicial register. 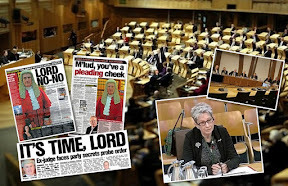 PUBLICATION of a transcript of evidence given by Scotland’s top judge before the Scottish Parliament - has reveal how poorly Lord Carloway faired in attempts to close a five year Holyrood probe on Petition PE1458: Register of Interests for members of Scotland's judiciary. The now published written report of the meeting at Holyrood – depicts a blundering, weak & evasive performance from Lord Carloway - who gave evidence to members of Holyrood’s Public Petitions Committee on 29 June 2017, in connection with calls to require judges to declare their interests in a publicly available register similar to MSPs and other branches of Government. 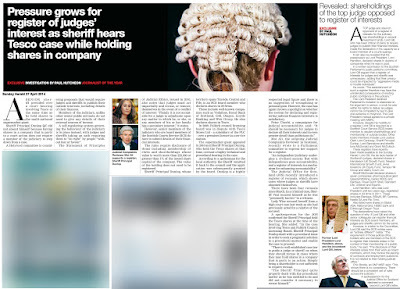 The written transcript of the surprisingly short 36 minute hearing – along with video footage - illustrates how Lord Carloway - lashed out transparency, court users, litigants the press, public, the internet and even social media - as reasons the judiciary should remain exempt from declaring their interests. 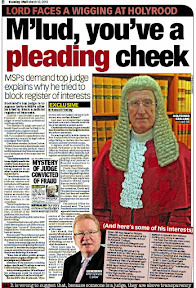 Lord Carloway (real name Colin Sutherland)- who earns over £220,000 a year – also declared to MSPs that creating a register of interests for judges would deter recruitment of ‘talented’ lawyers – reported in more detail by The National newspaper and across the media..
During the evidence session, the transcript reveals the full extent of how Carloway dodged question after question - with claims of ignorance on key points of judicial administration in Scotland - and even on the workings of foreign jurisdictions which Carloway himself has links to. 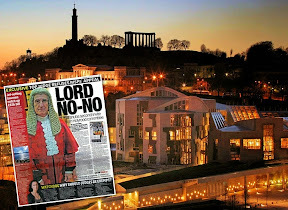 In response to questions from MSPs on comparisons between US judges declarations of interest and the refusal of Scotland’s judiciary to do likewise – Lord Carloway said he had no idea how US judges and their judicial system operated. 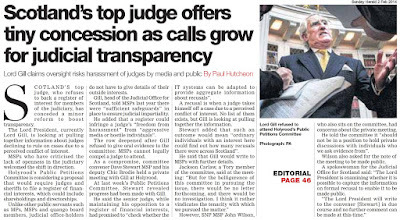 As the top judge fumbled response after response, it became evident MSPs were not buying into Lord Carloway’s dismal, widely criticised stance against the proposals calling for judicial transparency and bringing judges into line with other branches of the Executive - who are all required to declare and register their interests. 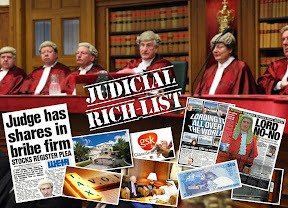 Evidence from the top judge reached a low point in the hearing - when Lord Carloway claimed a register of judicial interests is not required - unless scandal or corruption ‘is discovered’ - by the judiciary – and and investigated from within their own ranks. 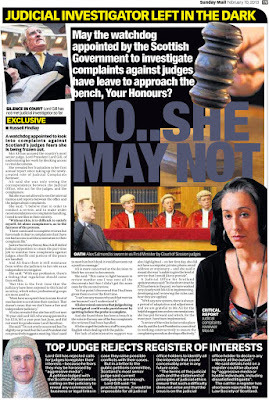 Lord Carloway’s stuttering performance was brought to a swift end by the Convener after detailed lines of questions from Alex Neil MSP saw Scotland’s top judge bounce from subject to subject, unable to offer a single clear reason as to why judges should be treated any differently from others in public life. The Convener (Johann Lamont): I welcome you all to this meeting of the Public Petitions Committee. I remind people to switch their mobiles and other devices to silent. Lord Carloway (Lord President of the Court of Session): I am not aware of details of members of other public institutions being subjected to online fraud, but judges are in a peculiar position in relation to this matter. They make decisions that inevitably cause disappointment to one party to a litigation, and those people are, or can be, resentful. I appreciate that that can happen in wider public life, but it is a particular problem for the judiciary. The Convener: Do you think that there is a general culture of people looking for explanations beyond the decision? 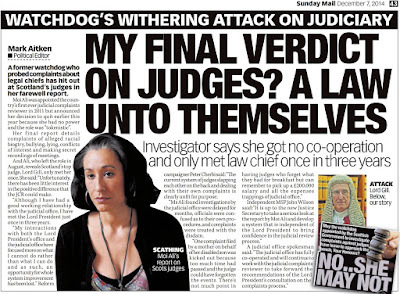 Do people do that already, not necessarily in respect of financial matters but by interrogating any connections that judges might have that might explain a decision? Lord Carloway: It is a relatively common phenomenon, especially with party litigants, who, if they lose their case or a particular aspect of it, may search for reasons as to why that has happened. They will search for reasons that are outwith the obvious—in other words, that they lost the case because they were wrong in law or in fact. They will seek reasons as to why the judge found against them, and they will search for things that are peripheral to the case. That is a problem that we have to deal with—“put up with” is perhaps the wrong expression. The Convener: Do you think that that is compounded by the world of online communication? Is online fraud now a particular issue? 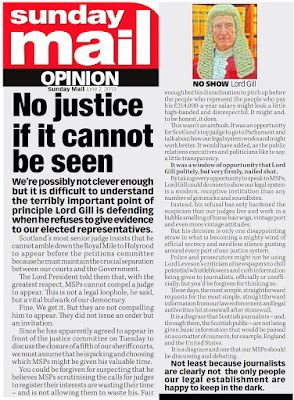 Lord Carloway: As followers of blogs and so on in relation to judges will know, there is quite a lot on the internet that is, shall I say, not terribly complimentary about particular judges. Again, that is something that we have to put up with on a daily basis. We are subject to basic abuse by litigants of one sort or another on the internet, and that should be guarded against. Angus MacDonald (Falkirk East) (SNP): Good morning, Lord Carloway and Mr Flinn. I very much appreciate your attendance at the meeting. 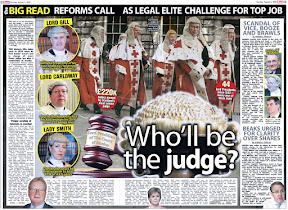 Lord Carloway: A judge or a sheriff is, indeed, like many people, a holder of a public office. The critical distinction between a judge and an MSP, for example, is, of course, that the judge has to be independent of any form of Government. That is what we are looking at. A judge is therefore in exactly the opposite position from those whose work has a political dimension. Angus MacDonald: You mentioned the career judiciary. 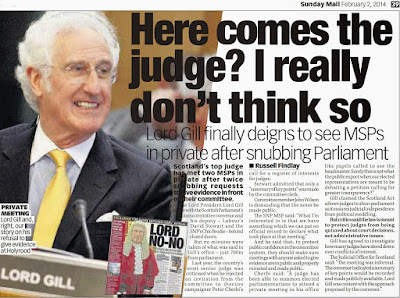 You will be aware that we took evidence from your predecessor, Lord Gill. It is probably fair to say that he did not have a high regard for the system in the United States, where there has been a register of judicial interests, as you will be aware. What is your view of the fact that the United States has successfully introduced a register of judicial interests? 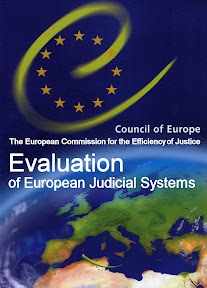 Do you agree that it has helped to increase confidence in the judiciary in that part of the world? Lord Carloway: I am not in a position to make any comment whatsoever about the United States judiciary. I simply do not know enough about it to make a meaningful comment. You will be aware that there are problems in relation to the United States judiciary, but I am simply not qualified to comment on the depth of the situation. Brian Whittle (South Scotland) (Con): Good morning. In relation to any changes to the current system of recusal whereby it is for a judge to decide whether to recuse, you have commented on the inefficient disposal of business in the courts. I would like to explore the balance between the efficient disposal of business and having systems in place that ensure there is trust in judicial decisions. In that respect, is there any way of quantifying the risks to the efficient disposal of business and, if so, whether your office has carried out an assessment of that? Lord Carloway: Are you talking about the process of declining jurisdiction, or recusal, as it is put? Lord Carloway: I preface my remarks by saying that, as far as I have a concern about this topic, it is not that judges are failing to recuse themselves in particular situations, because I am quite satisfied that they do so when they should. My concern—this is also to do with the disruption of business—is to do with judges or sheriffs who are recusing themselves unnecessarily in circumstances in which they should not do so. That is a much more common phenomenon. 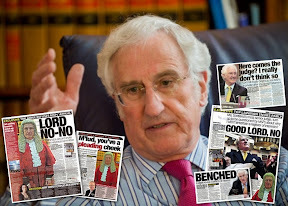 Lord Carloway: The answer to that particular problem is this: if a judge does not recuse himself in circumstances in which he should have done, any litigant who is dissatisfied with that and loses the case can appeal that and the matter will be reviewed by three judges. Therefore, there is a form of open, public scrutiny of the decision not to recuse a judge. If there were a system whereby that judge could not decide that matter himself or herself—after all, it is he or she who knows whether he or she has a direct connection with the litigation or the persons involved in it—and that person had passed on the matter to another judge or sheriff, the business in that case would be ceased for the period until that matter was decided. The business that is scheduled for the other sheriff or judge would also be ceased in order that the other judge could take the decision. That other judge is likely to find the decision difficult if he or she does not know the particular facts. 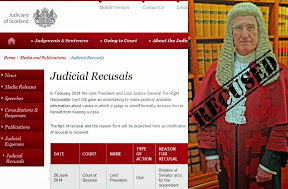 Angus MacDonald: We have received a submission on this petition from Melanie Collins, in which she highlights a recusal that had, for whatever reason, not been added to the register of recusals. That was only noticed, or challenged, one year after the omission. Lord Carloway: I note that there was an error in not recording one incidence. I am not particularly concerned about that. The position is that all recusals that appear in the register are as a result of events that occur in open court, in a public forum, and they are recorded in the interlocutor of the court concerned. I think that committee members have a copy of the interlocutor of the court order that deals with the recusal. That is a public document, which is open to public scrutiny. It is a result of the hearing in open court in which the parties would be well aware of the decision and they would have a record of it. Therefore, it does not particularly concern me that there was an unfortunate error in transposing that information into a register of recusals, which is for a different purpose. Angus MacDonald: Is that the only error that you are aware of? Lord Carloway: It is the only error that I am aware of. The judge or the sheriff will make a decision in open court. The direction to the clerks of court is that they should transmit that to the judicial office, so that it can be recorded in the register. If that was not done—it was not done in this case—that is regrettable, but it is not a matter of deep concern to me. One mistake in many instances does not cause me a concern about the general system. 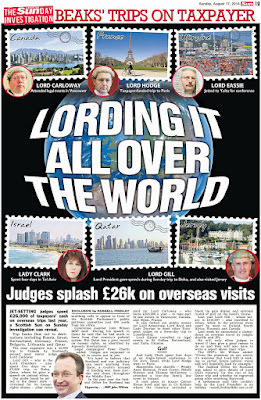 Lord Carloway: She was involved in the litigation. She must have known that the decision had been made, because she is the person who was presumably in court at the time. She, or her representatives, would have received a copy of the court order dealing with the recusal. Angus MacDonald: Okay. Thank you. The Convener: I welcome Alex Neil MSP to the meeting. He, too, has an interest in this item. I will take committee members first and if Alex Neil wants to ask a question after that he may do so. Rona Mackay (Strathkelvin and Bearsden) (SNP): Good morning, Lord Carloway and Mr Flinn. You talked about problems that you perceive there would be with recruitment should a register be introduced. I may have missed a discussion of this in our background briefing, but what is the Law Society’s view on a register of interests? Lord Carloway: I do not know the answer to that. Maurice Corry (West Scotland) (Con): Good morning, Lord Carloway and Mr Flinn. I welcome your indication that you would have no problem extending the register of recusals to cover instances where judges have considered recusal but have made the decision not to recuse. You indicated that what you considered may provide additional transparency—that follows on from Angus MacDonald’s comment. Have you considered options for the ways in which the register could be made transparent when any additions or amendments are made to it? Lord Carloway: Sorry, what is that in relation to? Maurice Corry: Options to make it more transparent. Lord Carloway: Do you mean that we could, for example, put the parties’ names in? Lord Carloway: That has been considered, but it is not thought to be particularly necessary or helpful. I return to the fact that all decisions whether to recuse are done in the public forum—they are done in open court. If anyone has an interest in seeing a particular court interlocutor, they can do so. For example, if someone was looking at the register of interests and wanted more details of that, I am sure that we could provide them with those details. However, we are often anxious not to put parties’ names in registers of a public nature such as this, because it is usual for cases to involve considerable sensitivities, such as children and so forth. Therefore, we would be reluctant to do that, but it could be done. Maurice Corry: It could be done, but it would have to be looked at very carefully. Angus MacDonald: Would you be content to see information about the date on which an entry is made or a way of noting amendments to entries in the register, such as to correct clerical errors, which we are aware happened on at least one occasion? Would that enhance transparency? Angus MacDonald: That is good. Lord Carloway: I thought that it was defeated. Angus MacDonald: Yes. Are you aware of whether any register was introduced in New Zealand, along the lines of a register of recusals or a register of interests, after that? Lord Carloway: I am not. I thought that the matter ended with the defeat in Parliament. Alex Neil (Airdrie and Shotts) (SNP): I apologise for being slightly late. I had to go to the Public Audit and Post-legislative Scrutiny Committee. I apologise in advance if I cover ground that has already been covered. 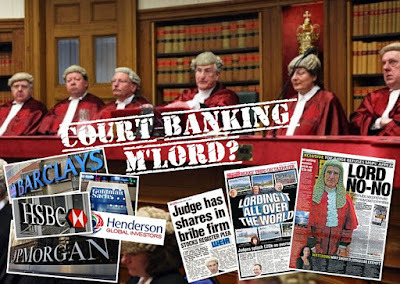 Lord Carloway: The short answer is that I do not believe that there is any problem with the current system, which is that the judge, who knows what his connection is to the case or the parties to it, should make the initial decision. That decision is made in open court, when the parties are present, and it is subject to review on appeal. In other words, if somebody is dissatisfied with that decision and if the litigant eventually loses the case, the decision will come before three judges who will review whether it was correct. If it was incorrect, the decision on the case would fall. Alex Neil: The person bringing the case to court may not be aware of any conflict of interest that the judge may have and may never find out that there was one, but the judge may well have been influenced by a particular interest. Surely that is not right. 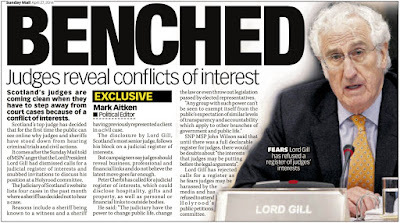 If there is any potential conflict of interest, surely there should be a declaration or commitment by the judge, making an explicit statement that there is no conflict of interest. People may not have the resources to appeal, for example. 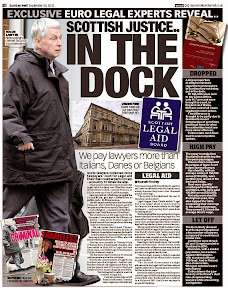 Is the system not balanced against people who come to court for justice? Lord Carloway: No, it is not. I go back to something that I mentioned earlier, which is very important. 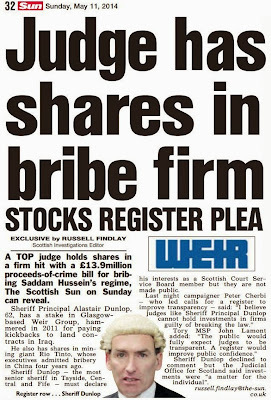 Scotland does not have a corrupt judiciary. 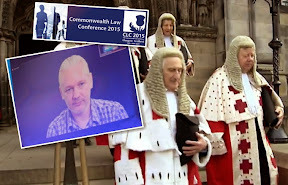 The matter has been examined by independent persons, notably the GRECO anti-corruption body that operates under the auspices of the Council of Europe, which examined the UK judiciary, including the Scottish judiciary. It was clear that, fortunately, we, as distinct from many other countries, do not suffer from corruption in the judiciary. For that reason, it did not consider that a register of interests was necessary. If one introduces such a measure, one has to be satisfied that it is necessary and also that it is proportionate. If one analyses its proportionality, one has to look at what exactly we are guarding against. 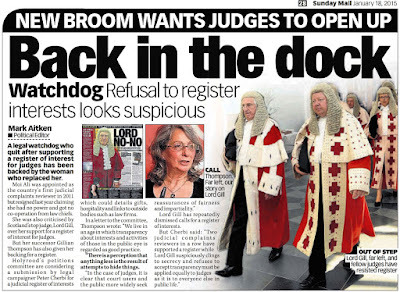 If the situation were to be that there was corruption in the Scottish judiciary—which we would discover at some point or another—of course we would have to consider measures to prevent that, one of which might be a register of certain interests. 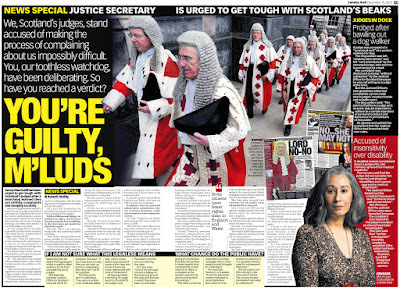 Until such time as it is demonstrated that there is corruption in the Scottish judiciary, I am entirely satisfied that there is no requirement for a register of interests and that it would be positively detrimental to the administration of justice, particularly in relation to the recruitment of judges and especially at the higher level of the judiciary. Alex Neil: I want to draw a parallel with the register of interests that members of the Scottish Parliament have to sign and regularly update. 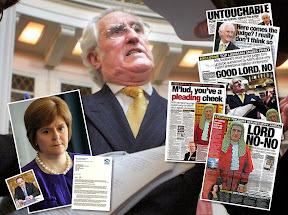 That came about not because of any allegations or belief that the system was corrupt or that members of the Scottish Parliament are corrupt. In the 18 years that we have been here, I have not heard one allegation of corruption. The register is there not because of allegations of corruption but to ensure that there is no prejudice. If I participate in a debate and I have an interest that I have not declared, I will be open to an allegation not of corruption but of prejudice. Because there is a register of interests and because I have to declare interests in a debate or in a committee meeting such as this one, there is a transparency to ensure that I do not act in a prejudicial fashion. Alex Neil: Have you investigated it? Lord Carloway: I am aware of the background to it. Alex Neil: No, but have you investigated it? 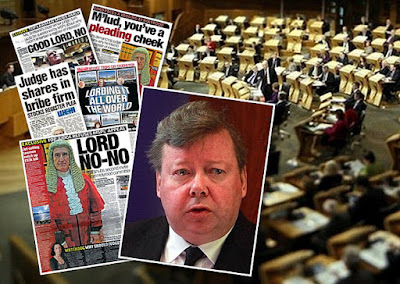 Lord Carloway: I have read the papers that it involves. Alex Neil: With all due respect, Melanie Collins and Donal Nolan have written to you on numerous occasions, and at no time have you replied to them, let alone met them, so you have not heard the other side of the case. Lord Carloway: I am sorry, but I am not aware of letters to me by those particular persons. The Convener: Alex, let us be careful that we do not get into anything specific on that. Alex Neil: Yes—absolutely. My point is about how Lord Carloway can reach that conclusion if he has not heard the other side. Lord Carloway: I have read documents emanating from the persons that you have mentioned. As far as I am aware, they were not addressed to me, but I could be wrong about that. The position is that I am aware of the circumstances of the case. I am satisfied that Lord Malcolm’s conduct was entirely correct in the circumstances. That is part of the problem that you have perhaps highlighted. That case has nothing to do with a register of pecuniary interests. The suggestion is that we should start registering what our relatives are doing, where they are working and matters of that sort, which I suspect would go way beyond even what is expected of politicians. Alex Neil: No—we have to register what close relatives do. 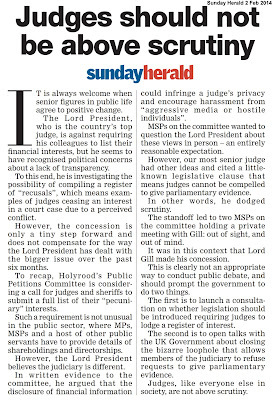 Lord Carloway: Can I deal with the difference between MSPs and the judiciary, which I think I dealt with earlier this morning? It is quite a different function. A politician is by nature someone who is not independent in the sense that the public expect the judiciary to be. That is not a criticism; it is a reality. As a generality, judges do not deal with the type of issues that politicians deal with. Politicians have executive power. They are dealing with major economic interests of one sort or another. As a generality, judges are not dealing with that type of thing. They are dealing with issues that are usually between private individuals but can be between private individuals and Government or others. Judges are not dealing with the type of issues that politicians are dealing with such as planning inquiries and so on at a local level or major economic development in society as a whole. The Convener: Last question, please, Mr Neil. Alex Neil: If I can just finally draw the parallel between our register and what has been talked about in terms of either recusal or financial interest, MSPs—as individuals and collectively—do not have executive power per se unless they are ministers, but what is very important is the perception of fairness and the perception that justice is being carried out. Lord Carloway: I disagree entirely with your analysis of that particular case and I repeat what I said earlier. The case that you refer to did not involve the judge’s son having any active involvement with the case whatsoever. We have very clear rules in our statement of principles of judicial ethics on how to deal with such matters and it is made very clear in that statement that if a relative is the advocate in the case before one, the modern approach is that the judge should not hear the case, or one could put it another way round—the relative should not be presenting the case. Whichever way it happens to be put, the situation that we had 20 or 30 years ago, when it was commonplace for the relatives of judges of one sort or another to be advocating the case, no longer exists. The Convener: There are no final questions, so I thank you very much for your evidence. It has been helpful to clarify many of the issues that you presented to us in written evidence and to have an opportunity to explore some of the issues around prejudice, for instance.